The Ichiyo School of Ikebana was founded in 1937 by sister and brother. The first headmistress was Ichiyo Kasuya , and the second headmaster was Meikof Kasuya. His sun , Akihiro Kasuya has became the third headmaster. Since its founding,the Ichiyo School has pursued a style of flower arranging that harmonizes with the various spaces in our enovironment. The Ichiyo School curriculum consists of six courses:Primary, Secondary, Advanced, Research, Instr ucor I and InstructorII. Each course covers 20 lessons with the aid of textbooks and efficient instruction. This approach enables students to progress within a short period of time. 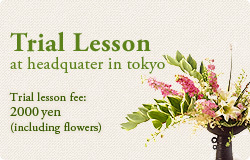 Since its founding The Ichiyo School of Ikebana has used the original textbooks to teach kindly. Wherever you learn , The Ichiyo School masters make same lessons with the textbooks. The Ichiyo School of Ikebana has made many wonderful exhibitions and participated in many exhibitions of japan and in many foreign countries. Akihiro Kasuya, the headmaster has made many demonstrations not only in Japn but many countries. During 2003, he has visited Myanmmer, Malaysia , USA and Europe. He thinks to introduce Ikebana around the world is very important.